The Miz and Maryse divulge that they never had a honeymoon because they were too busy working. Don’t ever tell me Miz isn’t the hardest working person in WWE after learning about this. He also struggles with jewelry knots, which, me too, dude. Nikki Bella and Brie Bella are heading to a dog agency to get their dogs famous. Nattie, who invited herself, is also going. The name of the agency is “The Dog Agency.” I like that. Let it be known what you do right off the bat. There is a dog in this scene. I should note that my dog hates dogs on television. He growls and barks and gets super annoying. HAVE SOME RESPECT, DOG, I’M TRYING TO WORK! Nattie shows up to the lunch meeting and begins to overtake things from the Bella’s. “My dog can sing.” “My cat can rap.” Those were true quotes. Maryse breaks kayfabe and explains “The Miz” character. We get highlights of a Miz vs. Dolph Ziggler match. Maryse informs us that Eva Marie and Jonathan are going on their honeymoon with them. Sounds like a terrible honeymoon. Nikki does an interview with WWE.com about her comeback. Miz, Maryse, Eva, and Jonathan head to Exuma for their joint honeymoon. They arrive at the house, which is of course super fancy and comes with a personal chef. Maryse just wants to swim with pigs. I’m sure you and Jonathan will share a pool at some point, dear. Nattie talks to Renee Young about her cats. This leads to Renee talking about her dog. 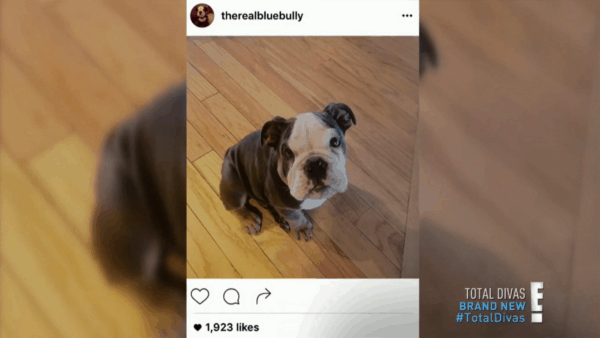 Daniel Bryan walks by, is asked who is cuter between Nattie’s cat 2 Paws and Renee’s dog Blue. Bryan avoids this conversation because he’s the smartest man on this show. Miz needs to do his fantasy football draft while on his honeymoon. Maryse is obviously not happy about this. What’s she want him to do, auto-draft? Girl, please. Nikki has her clearance meeting with WWE medical today. She walks out angry, confusing Brie. But, of course, she got cleared. Now she has to wait a week to see which brand she’s on. It took them a week to figure it out? No wonder this company struggles to make decisions. Nattie goes to visit Rosa Mendes, her baby, and fiance Bobby. Bobby designed shirts for 2 Paws. Nattie and Bobby come up with more ideas for the cat. They want the cat to have a gold tooth and a stuffed animal. The Exuma Four go out to dinner. Miz just wants to play on his phone. Miz finally sets his phone down and talks about spear fishing. The girls aren’t fans of this. Jonathan and Miz are bro-ing out so hard right now. Miz talks more about his fantasy draft. He has the second pick. He’s thinking David Johnson or Julio Jones. I hope he went Julio. Nikki heads to the WWE Performance Center. She concludes that she has to retire the Rack Attack. Back to Nikki at the PC. Bayley CAMEO! Nikki wants to add a submission to her moveset. She then explains to everyone what a submission is. Nattie goes out with Renee and Dean Ambrose. More talking about their cats and dogs. I apologize to everyone I have ever talked to about my dog. Especially, if I come off as annoying as these two. Nattie is upset that Renee is also getting shirts made by Bobby. “Renee is a copycat.” But I thought she liked dogs? Maryse ignores Miz in the morning. Miz took Odell Beckham Jr. with the 2nd overall pick. That’s a bit of a reach. They all head out to go spear fishing. They swim with a gang of baby sharks. The guys are really excited, the girls are scared. Nattie and Nikki head to training with Shayna Baszler. “She was like Ronda Rousey before Ronda Rousey ever existed,” says Nattie. They work to find Nikki a submission finisher. Nikki suddenly isn’t as high on the idea because she likes her power moves. Nattie talks to Brie about Renee being a copycat. Brie correctly points out that Nattie is a hypocrite because she invited herself to the meeting with the dog agency. She was nicer about it, though. Everyone is still friends. They now want Ambrose to wear a shirt of 2 Paws as a joke. The Exuma Four run out of gas on their boat. Maryse is still upset that they are going spear fishing instead of swimming with the pigs. Don’t they have like five days there? Swimming with the pigs takes like an hour. You have to fill out the rest of those days, right? As they stop to get gas, Miz does his Forrest Gump impression. They go spear fishing. Maryse catches a huge lobster with her hands. She has fun. Nattie tells Renee that she hates dogs. R-Truth gets dragged into the conversation. He’s on Team Dog. Brie gives Nikki a pep talk about finding a finisher. 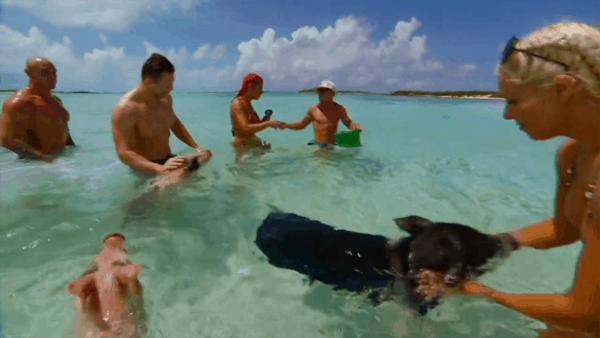 The Exuma Four finally go swimming with the pigs. Maryse is over the moon. Then we get a bunch of slow motion shots of Maryse and Eva in their bikinis. Nikki has her new finisher picked. But we have to wait to see it. OH THE INTRIGUE!